Christmas holidays and I realized that time passes by. Everyone else is getting older and older, while I stay young and alert. The year 1969 is soon 50 years ago. 1969 is not my year of birth, but a picture caught my eye and triggered me to make a short decade-jumping journey from 1969 to 2019. As usual, some of these pictures might be associated with a copyright or so. I have done my best (?) to note the source of the picture to the best of my (google’s) knowledge. While dry-browsing away a few hours in the morning in my cottage looking out over the Baltic Sea I came across this picture from the Woodstock festival. Obviously taken back in the days. Information hub at the Woodstock festival, 1969. The picture shows the communication method to and from the Woodstock festival area. Preliminary phone “boots” and desks for journalists, and others, to compose messages. Look at the guy in the foreground writing up a tweet. To the right some people working on their laptops and the guys standing behind, probably trying to help solving a software issue. By the phones, one lady is trying to get good 4G coverage. Or maybe not at all. In the background two guys chill out, or maybe they’re governmental agents. After all, this is during the Vietnam war. Seeing the picture above, I still wonder how they pulled things off back in those days? How were you able to organize a 400.000-attendee rock concert? Without e-mail and web pages? On the other hand, this picture is snapped pretty exactly 20 days after the first humans danced on the moon which turned out pretty well too. During 1979 I was alive (yes, I had a home computer). During 1969 I was not even considered. 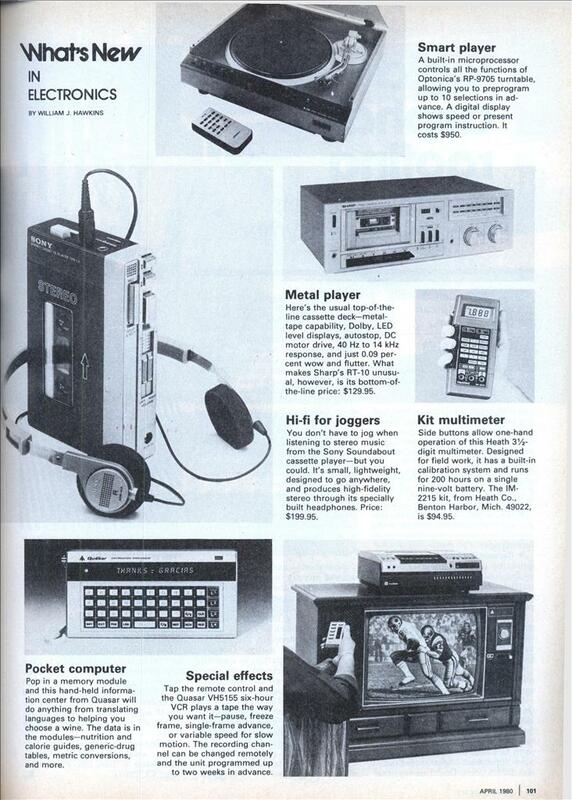 In 1979 the famous Sony Walkman was released and was more or less an instant success. Close to 350 Million units were sold worldwide. The picture below, though, is from 1980 (April). I borrowed the picture from this blog (Modern Mechanix): http://blog.modernmechanix.com/whats-new-in-electronics-sony-walkman/ and the picture is URL-referred to its source. It is not hard to see the connection between the 1979 Sony Walkman and the iPods of the 2010s. A new way, not just physically, to listen to music was offered. Also check the elegant TV set with the not-so-elegant VCR on top. Design was not the key thing here. Why wasn’t the VCR integrated with the rest of the furniture. 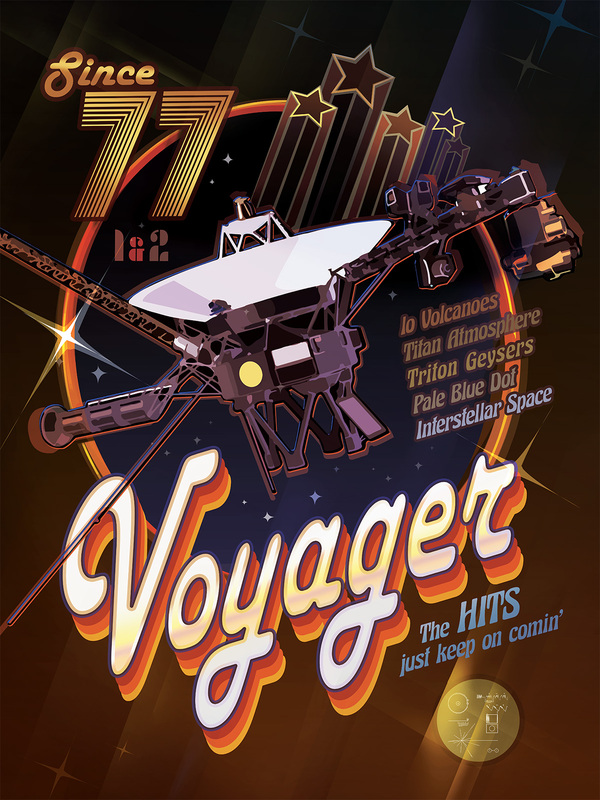 In 1979, the Voyager 1 and 2 space probes reached Jupiter. 1989 is an important date as it sort of marks the end of the cold war. If one wants to, one could also argue that it is the end of the Franco-Prussian war of 1870. But that’s just my playman observation. The more time that passes, it is hard to see the two great wars on European soil in the 20th century to be two separate conflicts. Nevertheless, in 1989 Voyager 2 reached Neptune. In 1989 the Game Boy was released and rocketed into most children’s hands. (Well, they sold approximately 120 million units and I guess there are more children in the world, but anyway…) So, it was shown that small, handheld electronical devices were sort of popular. Especially when they also could offer games. Sounds almost like it would make sense to merge games (1989), communication units (1969), and music (1979) into one single unit… hmm? The picture (which is from 1990) below is found on several places on the internet. Wikipedia compiles 1999 as the International Year of Older Persons (https://en.wikipedia.org/wiki/International_Year_of_Older_Persons) and that sets the pace of what happened that year. Voyager 1 becomes in 1999 the human-made object that has reached farthest away from Earth. Bill Gates becomes the richest person on Earth indicating that one can make money on computers. In February 1999, the Japanese company NTT Docomo offered their customers i-Mode, i.e., the first commercially availabe mobile internet. Within a year’s time they had 20 Million subscribers using i-Mode for e-mail, surf, etc. Obviously, a starting point for the wireless internet. Back in Sweden we had to fiddle around with WAP on Ericsson R380s (which, by the way, was a pretty cool phone back then, I’ve kept mine…) and similar phones. Who remembers the Nokia Communicator? Godzilla 2000 : Milennium. From IMDB. Wireless Internet – here we come! 2009 is only 10 years ago, sounds like yesterday. Could anything have happened since then? In such a short period of time? Voyager 2 passes the heliosheath, the solar bubble, and sort of leaves our solar system. 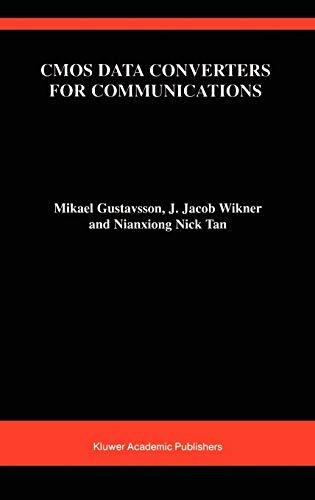 In Christmas time 2009, the LTE communication standard is commercially launched in Sweden and decent data rates can now be obtained. The standard enables the arrival of smarter phones that can be used to eat up all the bandwidth you didn’t know you needed. The HTC Dream, the first phone with the android operating system, was launched in late 2008 and was globally available in 2009. I guess, back then more important, was the release of the iPhone 3GS in Q3 2008 reaching large volumes in 2009. Somehow we had released all those functions from above: games, surf, communication, Yo!-apps, etc. 2019 hasn’t happened yet (as far as I know). What is promised, however, is that 5G will be launched. 5G will be commercially available for customers in South Korea. In fact, it is already available since December 1, 2018. But the large impact will happen next year. Higher data rates and more apps that will eat up that budget, etc. 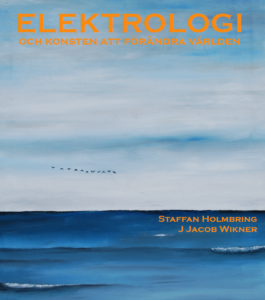 Self-driving cars, smart homes, wireless sensor networks, energy harvesting, etc. Loads of buzz words. It will be interesting to see. The Voyager 2 probe has now completely left our solar system and entered interstellar space. In another 40000 years it will have left the Oort cloud. Interestingly, we still receive daily messages from them. From some 20 billion kms away…. And thinking about it – where will we be 2069? What will happen 2029? 2039? 2049? 2059? A friendly soul has left a magazine in my university mail box. Yet to find out who. But it is a 56 year old magazine called “Radio och Television”, issue number 2 from February 1962. Pleasant reading! Remember that this is the beginning of the transistor revolution (arguably it started some years earlier, maybe in 1957 when the traitorous eight left Shockley in his lab and started with Fairchild Semiconductor. Nevertheless, in the magazine we find an interesting article on a home-made transistor amplifier for high-fidelity music. Stereo, even. There are a lot of different ads offering you to buy the latest available silicon-based diode and transistor. There is also an interesting article on “Project echo“. This is back in 1962. Sputnik was launched some years before that and some dozen of satellites were back then circulating the earth. But none of them were used for telecommunications. Now, you could of course read the wikipedia page, but that was written after the project was done (it lasted from 1960 to 1964). The above article was written at the middle of the project. The Americans launched aluminum-coated balloons that would act as reflectors high up in the sky (1600 km ! ), like a satellite. Using the reflector they could hurl 960.05-MHz radiowaves in one direction and 2.39 GHz in the other. The transmit power was up to 10 kW for the FM modulated signals. The balloon was located using an overlayered radar beacon and a precalculated assumed trajectory (stored on punch tape). The punch tapes gave the radar a first position where to search for the balloon and then it was fine tuned using the radar beacons. Then, later that year, the R2-D2-inspiring Telstar satellite was launched and even though it only orbited for half a year and only produced a 2-W output signal, it could still convince humanity of the possibilities and importance of telecommunications. Over lunch the other day, I promised to write a post on this rather quiet forum… so what to write about? Weather? Politics? Illnesses? Trump? Maybe something more important: word processing software. The other month I had to go back to some old files we created some 20 years ago (like a Ph.D. dissertation, a text book, and a course text book, and other things). It was time to revisit a dear old friend of mine: FrameMaker. We used FrameMaker a lot at the University back then and then later also at Ericsson and Infineon. FrameMaker is nowadays owned and developed by Adobe (well since 1995, but it feels like yesterday :o). It was initally created by the Frame Technology Corporation, but is now revamped, quite a lot. First, I used to work – a lot – with FrameMaker on unix back in the old days with a slightly different look-and-feel. The Windows version was – and still is – not really the same experience. The pods, for example, cannot be resized. For example, the equation pod could in the unix environment be maximized which allows you to see all panels at the same time. Perfect for fast maths typing. See below. There are perks, however, with the equation editor: it can do calculations for you, simplify your equations, sort, and reshape, etc. It requires a bit of training and thinking, but once you have it up and running, you can quickly type an equation and then do the manipulations and go towards a resulting, compressed equation demonstrating your results. There are discounted subscriptions to use the tool on a monthly basis and if you have the opportunity ask your employer to give you access and give it a try. There are interchange formats to bring back and forth from and to other commercially available tools. Anyone else using FrameMaker out there? Ok, so the pi-day is up and running (March 14, i.e., 3-14). At approximately half past three today, some kind of pi would be served around the globe. So what else do we have? Is this it? Are there no other fancy constants that we could appreciate throughout the year? Of course there is… forza some python and loop over the most commonly (according to Wikipedia) used constants. Standard integers aside. A euro-date below is “Day/Month” and a US-date is a “Month/Day”. I have found the best-matching date in a least-square sense. Notice the possible benefits of celebrating some/most constants twice a year if using both Euro and US date formats! I’ve however given preference to as early dates as possible for constants approximating to the same value for several dates. For example the interesting Legendre’s constant (= 1) which could be celebrated quite a few times throughout the year, but let’s stick to January 1. It is also worth noticing that the Feigenbaum constant approximation day could be celebrated today instead of pi. Btw – what else than celebrating the imaginary number i on February 30. When will we bump into a transistor everywhere? A while ago I made a comparison between Ostrogothia (Östergötland) and a silicon wafer. I wanted to put things into a graspable scale. If a transistor compares to an everyday object – how present will they be? Maple-Martin, while digesting some Guinness at an Irish conference, suggested to take a look at the total number of available transistors on earth. According to Intel there were some 1.2e21 transistors worldwide last year(-ish). 1 200 000 000 000 000 000 000 pcs * 0.000 000 1 m/pcs = 120 000 000 000 000 m = 3 000 000 laps (!!!) around the globe. If the transistors would be 600×600 sq um we would be able to cover the earth. 2010 – anyone? Let’s bring the comparison further: Each human consists of some 37e12 cells which multiplies into a biomass of 37e12 * 7e9 = 270e21 human cells. Compare with 1.2e21 transistors – we are soon there! Soon we can assign one transistor to each human cell. 1984 – anyone?